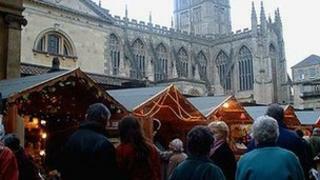 Pressure is being put on Bath to cope with huge crowds because of its Christmas market's popularity, it is claimed. Traders have complained about too many people attending, with one stallholder even asking for shoppers to stay away. On Saturday more than 20,000 turned up, causing gridlock and problems with chip-and-pin card readers. Bath's business improvement district manager said the market had not become too busy, and it was good for trade. The annual market in Abbey Churchyard, which began in 2002, features more than 150 traditional wooden chalets, each selling gifts and food. Coachloads of tourists come from all over the UK to see it. A Bath and North East Somerset (Banes) Council spokesman said he expected all 143 coach parking spaces to be full again this weekend. First Great Western said an extra 12 trains would be running to and from the city to meet demand. The problem was made worse on Saturday with Bath Rugby playing at home, which led to an increase in crowds. Trader Paul O'Donnell, who runs the Wooden Things stall, said: "I shouldn't say don't come, but don't come on a Saturday, it's absolutely manic. There's hardly any room to walk here." Chris Burt, from The Happy Cupcake Company, said: "[Saturday] was just solid with people from about 9:30 to the end of the day. "We had problems with the card reader. It packed up just due to the sheer volume of people in the area - because of the amount of card machines that everybody has now, and everybody using their mobiles to check football scores and that kind of thing." Bath's Business Improvement District (BID) manager, Andrew Cooper, said he did not believe the market had become too successful. He said: "Lots of places have tried to mimic it which is the best form of flattery. "Events that drive footfall into the city centre that support our retailers are incredibly important. When high streets nationally are suffering we have a very vibrant scene here in Bath, and the market is part of that." Nick Brooks-Sykes, of Bath Tourism Plus, said: "Clearly last Saturday was very busy because of a combination of the rugby, fine weather, the first day of the market and pay day. "All of those things combined to deliver one of the best trading days the market has ever seen." Mr Brooks-Sykes said an estimated 20,000-plus people had visited the market on Saturday. "Lots of people enjoy the crowds and the throng and the ambience and the vitality of a busy event, but if you prefer a quieter time then the market is open through the week," he added.